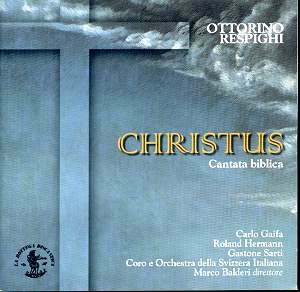 Christus was an apprentice work written before Respighi had reached twenty. It was a composition assignment and not only unperformed at the time but apparently pretty much forgotten by its composer. The score is preserved in Bologna, at the Civico Museo Bibliographico and it seems clear that the then violin student had previously written only three very minor instrumental works. This makes the big scale of this Biblical Cantata all the more noteworthy. Respighi clearly wanted to flex some compositional sinew. The introduction announces influences as broadly German Romantic. A British auditor might think vaguely of Parry, though that’s a very approximate reference point. The writing is confident, competent, swiftly lyrical and accommodating of moments for the orchestral leader – Respighi thus thinking both of himself as composer and as soloist manqué. The word setting is conventionally syllabic. He threads reflective orchestral passages after things such as the Temptation scene with precision and deft appreciation of the dramatic dictates of the score. The Second Part has a quasi-operatic force at the point of Judas’s kiss. Here Respighi serves notice of the embryonic colourist to come. As yet though his responses are too run-of-the-mill for real individuality to have emerged. The pre-seizure scene has corresponding quiet delicacy in the wind section and the taking of the bread scene has more than its share of Parsifalian hints. Then there’s the protracted finale, with its Mastersinger-fixated moments and a fugal section. That’s a shame because compression would have alleviated the callow absorption of grandiose Wagnerian models. They quite unbalance things. There are three soloists with roles for a tenor, St Matthew, a baritone, Christ, and for Judas the bass. The baritone is rather blustery at times but all three are certainly committed singers if not necessarily especially subtle. The recording was made live in the Auditorium RTSI in June 1991. The copyright is that of Claves so it’s possible that this has emerged previously though if so it’s flown under my radar. Finally, though the texts are in Latin and English to have only two tracks is a distinct disadvantage in a two-part work lasting sixty-six minutes.